With summer nearly here, we want to share a different sort of coffee recipe, sure to inspire leisurely backyard meals. 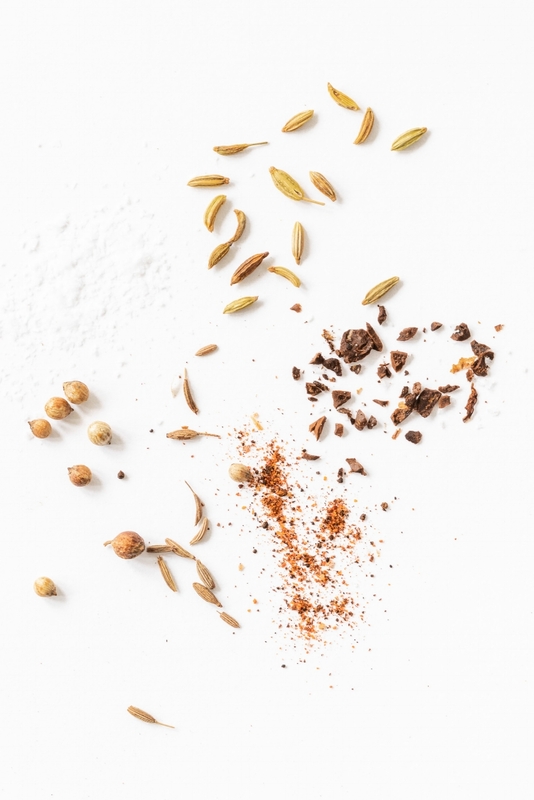 Chef Nora Haron, of Oakland’s Drip Line cafe, offers an easy (and addictively good) coffee rub for grilled or roasted meat. Haron, originally from Singapore, pays homage to her home country’s cuisine by using one of our Sumatra-influenced coffee blends in combination with toasted spices. 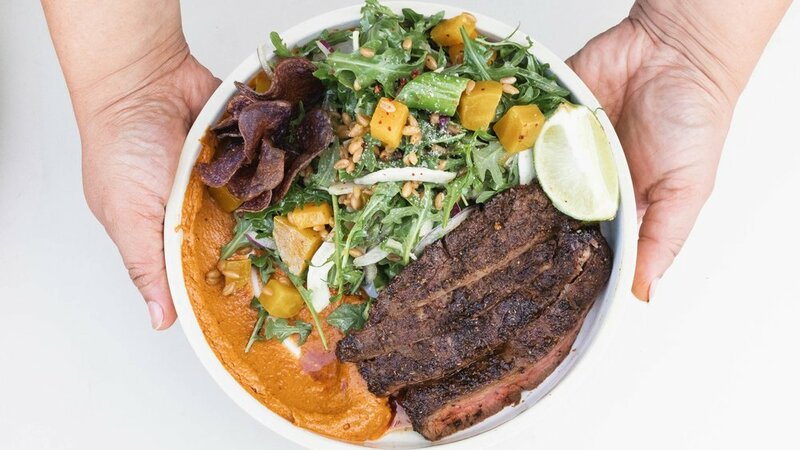 For a memorable lunch, we ate slices of seared steak with Drip Line’s California-influenced Gado-Gado—a salad famous in Indonesia and ubiquitous in Singapore—and her irresistable peanut sauce. Entering Drip Line cafe off of an industrial street in West Oakland, we’re reminded of how heart and skill, when expertly combined, have the power to change the feel of an entire city block. With high ceilings, clean lines, and Nora's eye-popping pastries, Drip Line is the kind of place that puts you at ease immediately upon entering. We came to know Nora when she was dreaming up recipes for Blue Bottle’s Culinary team. When the opportunity to run her own kitchen arose, she couldn’t pass it up. Luckily for us, she’s moved just a couple of miles away to West Oakland. Born and raised in Singapore, Nora plays with the country’s revered cuisine, itself a pastiche of ingredients and methods borrowed from native Malay culture; neighboring China, Indonesia, and India; and former colonial power, Japan. No matter the dish, the cooks of Singapore share an inclination to balance the sweet, salty, and sour elements within it. Nora’s route to cooking was a circuitous one. After a career as a shoe designer in Italy, she realized that despite her family’s hope for her to find a job outside of the kitchen (where her mother spent much of her time), it was in the kitchen where Nora felt most at home. 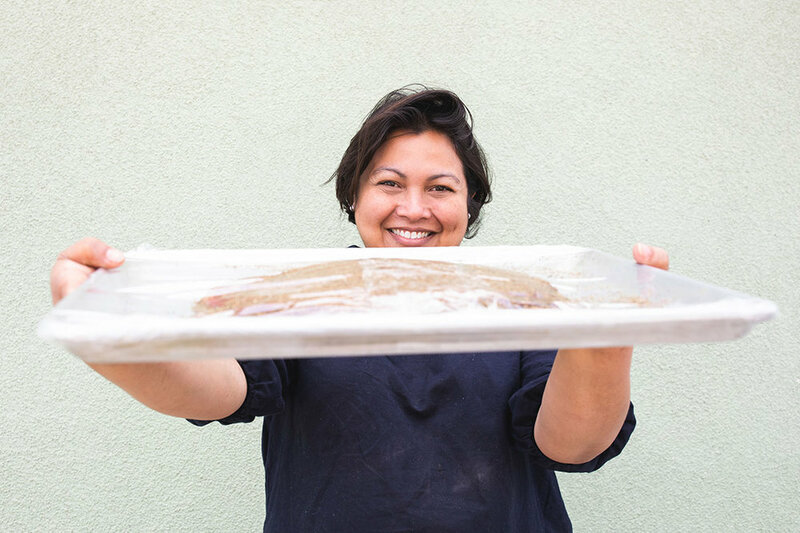 After completing a pastry program at the San Francisco Baking Institute, Nora consistently found work in coffee-centric cafes and restaurants. Indeed, we’d head to Drip Line any day to enjoy an espresso, though her iced chai, rich with fresh ginger and sweetened condensed milk, is hard to pass up. 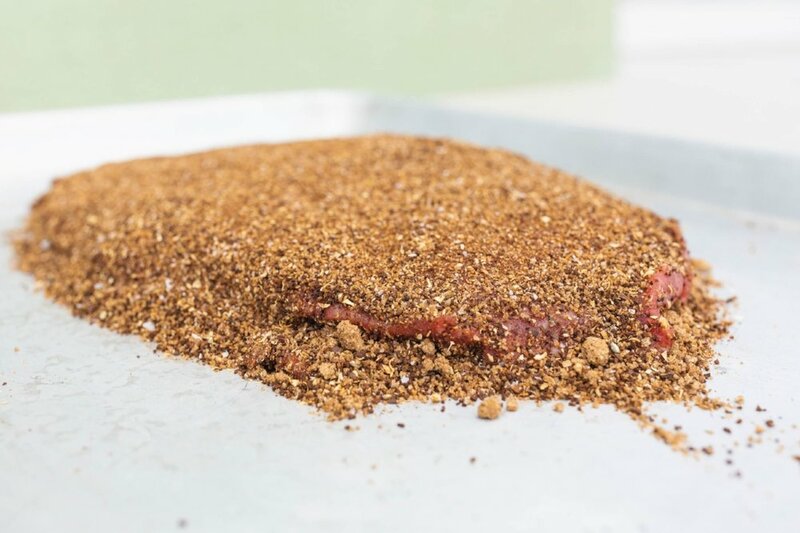 For this recipe, we asked Nora to devise a coffee-based meat rub that would work well with beef, pork, or chicken. For our test run, we sampled grilled steak, and we loved how Nora used one of our favorite blends, Bella Donovan, amplifying the earthiness of the blend’s Sumatra component by adding toasted coriander, cumin, and fennel seed. The coffee combines with the spices, and when seared, becomes a bass note that adds unusual and appealing complexity. When Nora lightly dressed her version of Gado-Gado salad and added a pepper-rich peanut sauce on the side, we knew we were tasting something we’d like to eat all summer long. In a small bowl, mix all of the ingredients together except for the steak. Using paper towels, dry the steak on both sides. If the steak is refrigerated, bring up to room temperature for at least a half-hour. Cook on a grill over a medium flame, or in cast iron pan over medium-high heat, for 5 to 6 minutes on each side. Once the meat is cooked to your liking, remove from heat and let rest for at least 10 minutes. Using plastic gloves (or extra caution in order to avoid touching the seeds), remove seeds from the California chiles. Place in small bowl and pour just enough boiled water over the chiles to cover. Let the chiles soften for 5 to 10 minutes. Remove the chiles from the water and place into a blender, along with the Fresno peppers (with seeds), shallots, garlic, ginger, lemongrass, and spices. Add 1/2 cup of water, and blend to make a smooth paste. If the consistency is dry or crumbly, add up to 1/2 cup more of water until the paste becomes pliable and smooth. Place a little oil in a medium saucepan, over medium heat, and sauté the paste until the oils have separated and the paste becomes aromatic, about 8 to 10 minutes. Add the peanut butter, along with a little more water to loosen the mixture. Stir to incorporate and cook until the sauce thickens, about 5 minutes. *The peanut butter for this sauce should not have any fillers or hydrogenated oil. Nora recommends using whatever vegetables and cooked grains you have on hand. 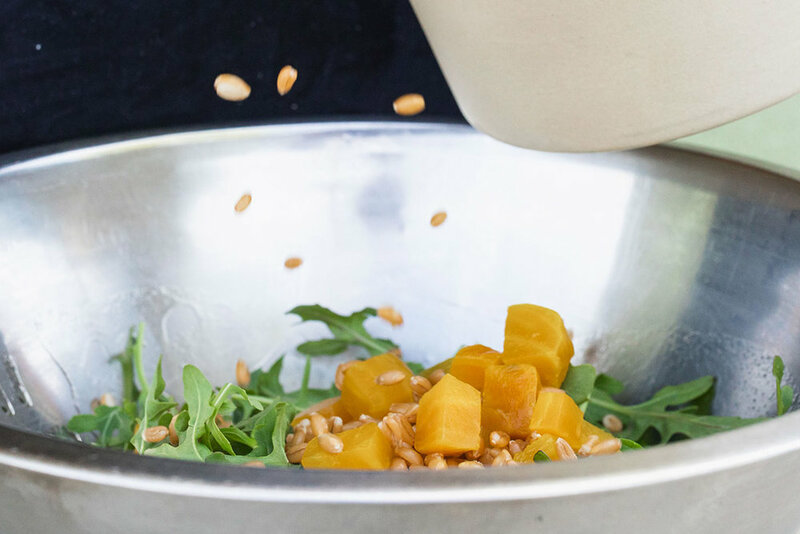 Drip Line's Gado Gado combines cooked farro with arugula, roasted and cubed golden beets, blanched asparagus tips, shaved fennel, and thinly sliced red onions. Nora dresses it simply, with just olive oil, and then sprinkles a combination of sea salt and Marash pepper over the top. She garnishes it with purple potato chips and adds a slice of lime. Once the salad is made, compose each plate with slices of steak, a handful of salad, and a generous dollop of peanut sauce. Squeeze the lime over all of it. Enjoy.